Acme H3-316EFR storage server, 3U rackmount, hardware RAID, Black Color. 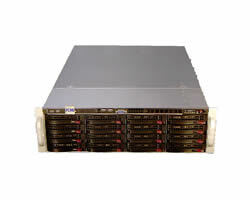 Good performance multi-function/ storage system for email, database, and VM applications. This will be a high performance NAS storage box if storage OS (like Windows storage server 2012, Open-e) was installed. Supports up to 32GB of unbuffered ECC DDR3 1333/1600Hz memory. 1 PCI-e 3.0 x8 slot (socket x16). 1 PCI-e x8 3.0 slot. installed LSI 9271-4i (PCI-e 3.0, 1GB DDR3 cache) SAS2 hardware RAID controller to handle 24 hot-swap drives, supports SAS2 and SATA3 6Gbps enterprise storage drives, RAID levels 0, 1, 5 and 6 and RAID spans 10, 50 and 60 .
onboard 6 ports Serial ATA (SATA), 2 SATA3 (6Gb) + 4 of SATA2. up to 8 USB 2.0 (Universal Serial Bus) ports -- 2x USB 3.0 ports (1 Type-A, 1 via header), 6x USB 2.0 ports (4 rear, 2 via header). VGA - On-board Aspeed AST2400 graphics. 3U rackmount case with 700W redundant power supply, gold level 80+. 16 of 3.5" HDD bays ( w/ backplane SAS2 expander, hot-swap). 1 slim CD bay, 1 slim FDD bay..